Sapphire Village sits on a hillside overlooking Sapphire Beach Resort and Marina. This superb location provides easy access to Sapphire Beach Resort's activities, beach and services. Studio and one-bedroom suites have fully equipped kitchens and balconies. Experience the best beach and best views in St Thomas. Its just a short walk from our vacation condos to all the beauty of world-famous Sapphire Beach. 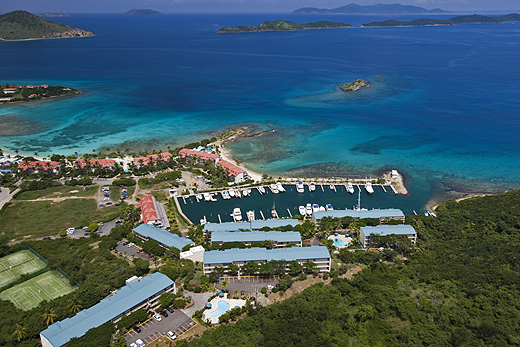 Our hillside buildings look out over Sapphire Beach, Tortola, Jost Van Dyke, St. John and numerous other islands. To view our suites, take the Sapphire Village Photo Tour. An excellent golf course is close by. Ferry trips to St. John and the Virgin Island National Park are just minutes away. For more things to see and do on St. Thomas, see our page About St. Thomas.